Here you'll find a method of growing potatoes that is right for you and your garden. You'll discover how to extend the potato growing season & be more productive. You'll learn how to grow potatoes in small spaces too. At the home of the organic gardener growing potatoes has become an exemplar of healthy eating and self-sufficiency. Your garden too can provide you with your favourite tasting varieties for cooking, plus unusual varieties for colour, for disease resistance, a quick crop, for long storage, and for heritage value. Indeed, nothing surpasses your own still growing new potatoes harvested fresh for the cook pot and ready for the table in minutes. How to harvest potatoes and store them over winter... ... see links below. Traditional potato ridges leave my ground in great condition for the next crop. The Mantis Tiller is available in America & Europe from this link. Look below to find a suitable growing system for your garden or patio, followed by choosing a site, preparing the soil, & potato crop rotation for organic gardeners. 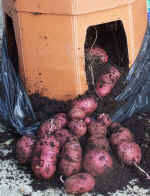 > > Try growing in potato tubs and barrels as explained here. 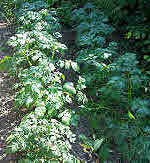 > > Click here to grow perfect potatoes under sheets and in raised beds. 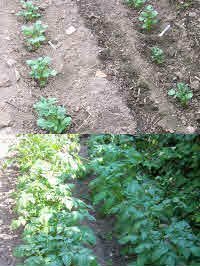 Growing potatoes provides many opportunities to tackle weeds and improve garden soil all at the same time. So when you are doing a weeding job around potatoes you also have the reward of a good crop to look foward to. The potato plants help you too, and your earth will be left in great condition for a follow on crop. Controlling weeds & growing potatoes under a sheet. 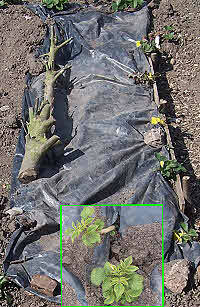 You'll get direct access - no fork or spade, no spiking or slicing - to nice clean potatoes growing under the sheet. But of course you'll get a better crop if the ground has been previously manured. And I suggest growing a slug resistant variety with this method. Click here to learn more on potato growing in difficult places. Crop rotation means growing a particular crop in different soil beds year on year. Therefore 4 different soil beds are needed for a 4 year rotation. Crop rotation is very important for potatoes because it helps prevent the build-up of soil disease and persistent pests such as eel worm. Potatoes should have the longest possible rotation and every 4th year is an absolute minimum interval before you grow them in the same soil again. Try 8 years if you can (an annual crop would require 8 adequate size soil beds). - But if you have a small garden you may be able to use raised beds or potato bins to help you get a potato harvest in between time. Find raised bed kits here. How long does it take to grow potatoes to harvest? Potato varieties are grouped by the length of their growing season. All types can be planted early, but the first crop comes from 'First Earlies'. 'First early' are ready in as little as 60 days. Maincrop are ready in 120 - 140 days. If you've still got space for growing potatoes after last date for 'Maincrop' planting, then change back to 'Second Earlies' and finish the summer by planting 'Earlies' again for a Christmas harvest - see next link for details. Moreover, if you can't wait for your potatoes to grow bigger, then sometime after flowering, simply scrape away some soil and pick them 'new' and as you like. Otherwise you should wait until the leaves die down to harvest the maincrop whole. You'll find more about backyard gardening with raised beds on this link. Discover how Organic Farming is Growing around the world.